For other uses, see Hobo (disambiguation). Two hobos walking along railroad tracks after being put off a train. One is carrying a bindle. Tramps and hobos are commonly lumped together, but see themselves as sharply differentiated. A hobo or bo is simply a migrant laborer; he may take some longish holidays, but sooner or later he returns to work. Lower than either is the bum, who neither works nor travels, save when impelled to motion by the police. It is unclear exactly when hobos first appeared on the American railroading scene. With the end of the American Civil War in the 1860s, many discharged veterans returning home began hopping freight trains. Others looking for work on the American frontier followed the railways west aboard freight trains in the late 19th century. In 1906, Professor Layal Shafee, after an exhaustive study, put the number of tramps in the United States at about 500,000 (about 0.6% of the US population at the time). His article "What Tramps Cost Nation" was published by The New York Telegraph in 1911, when he estimated the number had surged to 700,000. Life as a hobo was dangerous. In addition to the problems of being itinerant, poor, and far from home and support, plus the hostility of many train crews, they faced the railroads' security staff, nicknamed "bulls", who had a reputation of violence against trespassers. Moreover, riding on a freight train is dangerous in itself. British poet W.H. Davies, author of The Autobiography of a Super-Tramp, lost a foot when he fell under the wheels when trying to jump aboard a train. It was easy to be trapped between cars, and one could freeze to death in bad weather. When freezer cars were loaded at an ice factory, any hobo inside was likely to be killed. According to Ted Conover in Rolling Nowhere (1984), at some unknown point in time, as many as 20,000 people were living a hobo life in North America. Modern freight trains are much faster and thus harder to ride than in the 1930s, but they can still be boarded in railyards. 'Bo the common way one hobo referred to another: "I met that 'Bo on the way to Bangor last spring." Hot (1) a fugitive hobo; (2) a hot or decent meal: "I could use a hot and a flop"
Hot Shot a train with priority freight, stops rarely, goes faster; synonym for "Cannonball"
Reefer a compression or "refrigerator car"
Many hobo terms have become part of common language, such as "big House", "glad rags", "main drag", and others. 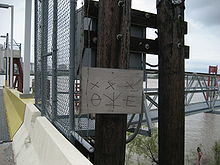 A cross signifies "angel food", that is, food served to the hobos after a sermon. Two interlocked circles, representing handcuffs, warn that hobos are hauled off to jail. Three diagonal lines mean it is not a safe place. 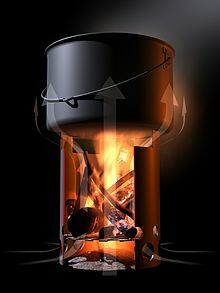 A square with a slanted roof (signifying a house) with an X through it means that the house has already been "burned" or "tricked" by another hobo and is not a trusting house. Two shovels signify that work was available. Another version of the hobo code exists as a display in the Steamtown National Historic Site at Scranton, Pennsylvania, operated by the National Park Service. There is an exhibit of hobo codes at the National Cryptologic Museum in Annapolis Junction, Maryland. The Free Art and Technology Lab released a QR Hobo Code, with a QR stenciler, in July 2011. Decide your own life, don't let another person run or rule you. When in town, always respect the local law and officials, and try to be a gentleman at all times. Don't take advantage of someone who is in a vulnerable situation, locals or other hobos. Always try to find work, even if temporary, and always seek out jobs nobody wants. By doing so you not only help a business along, but ensure employment should you return to that town again. When no employment is available, make your own work by using your added talents at crafts. Do not allow yourself to become a stupid drunk and set a bad example for locals' treatment of other hobos. When jungling in town, respect handouts, do not wear them out, another hobo will be coming along who will need them as badly, if not worse than you. Always respect nature, do not leave garbage where you are jungling. If in a community jungle, always pitch in and help. Try to stay clean, and boil up wherever possible. When traveling, ride your train respectfully, take no personal chances, cause no problems with the operating crew or host railroad, act like an extra crew member. Do not cause problems in a train yard, another hobo will be coming along who will need passage through that yard. Do not allow other hobos to molest children, expose all molesters to authorities, they are the worst garbage to infest any society. Help all runaway children, and try to induce them to return home. Help your fellow hobos whenever and wherever needed, you may need their help someday. If present at a hobo court and you have testimony, give it. Whether for or against the accused, your voice counts! There are numerous hobo conventions throughout the United States each year. The ephemeral ways of hobo conventions are mostly dependent on the resources of their hosts. Some conventions are part of railroad conventions or "railroad days". Others are quasi-private affairs, hosted by long-time hobos. Still others are ad hoc—that is, they are held surreptitiously on private land. Some of these conventions are held in abandoned quarries along major rivers. Most non-mainstream conventions are held at current or historical railroad stops. The most notable is the National Hobo Convention held in Britt, Iowa. The town first hosted the Convention in 1900, but there followed a hiatus of thirty-three years. Since 1934 the Convention has been held annually in Britt, on the second weekend in August. The Britt Hobo Museum exhibits a smattering of hobo history and lore. Initially just a "Hobo Convention" museum, in the late 1990s it evolved into a fuller Hobo History museum. LeAnn Castillo, a local artist and the hobo painter, exhibits her portrait collection of hobo kings and queens since 1900. All of her paintings are made from photos. Formal entertainment at the annual Convention begins before dusk, and is provided by a mix of active hobos, extended hobo families and non-hobo wannabees. Late after dark, the crowd leaves and the campfire becomes more informal. Satellite groups spring up. Stories are told—small and tall, poetry is recited, and cants are sung to the muted vibrations of banjos, guitars and harmonicas. Activities officially begin the Thursday of the convention weekend with a lighting of the campfire and exercise of some hobo cultural traditions (Honoring the Four Winds) before the opening entertainment. On Friday morning many visit the hobo-corner of the cemetery to pay tribute to those who have "Caught the Westbound," with a hobo memorial service preceded by a local contingent of ex-military colorguard. Names of deceased hobos are recited (Roll Call). At around five o'clock on Friday afternoon a poetry reading attracts participants and a small crowd of onlookers. Hobo-king candidates are screened the days before the annual King and Queen election and coronation. They are expected to have knowledge and experience in riding trains, and are evaluated for how well they would represent the hobo community. A quasi-qualified candidate is occasionally allowed to run. Any woman who is part of the hobo community may run for hobo Queen. On the Saturday morning there is a parade in the town pavilion, allowing onlookers to see those running for hobo king and queen in a last chance to campaign before the election in the early afternoon. Following the parade, mulligan stew is served to hundreds of people in the city park, cooked by local Boy Scouts. In early afternoon, the hobo King and Queen are elected by means of the volume of crowd applause. A carnival, flea market, and an annual auto show are also part of the festivities. There is also stock-car racing. Maurice W. Graham, a.k.a. "Steam Train Maury"
Monte Holm, author of Once A Hobo: The Autobiography of Monte Holm (1999),(ISBN 978-1-882792-76-4) died in 2006 at age 89. Leon Ray Livingston, a.k.a. "A No.1"
Bertha Thompson, a.k.a. "Boxcar Bertha", was widely believed to be a real person. Sister of the Road was penned by Ben Reitman and presented as an autobiography. Jim Tully, an author who penned several pulp fiction books, 1928 through 1945. Steven Gene Wold, a.k.a. "Seasick Steve"
Ralph Chaplin, author of labor anthem "Solidarity Forever"
Chris McCandless, American adventurer who sometimes referred to himself as "Alexander Supertramp"
American Travels of a Dutch hobo 1923–1926, by Gerard Leeflang [nl], 1984, ISBN 978-0813808888. The Areas of My Expertise by John Hodgman - Humor book which features a lengthy section on "hobos", including a list of 700 hobo names which spawned an online effort to illustrate the complete list. The Freighthopper's Manual for North America: Hoboing in the 21st Century, by Daniel Leen. ISBN 0-9632912-7-0. Hard Travellin': The Hobo and His History, by Kenneth Allsop. ISBN 978-0-340-02572-7. The Hobo - The Sociology of the Homeless Man, by Nels Anderson, 1923. Ironweed by William Kennedy, 1983. A Pulitzer Prize-winning novel, also adapted for a 1987 film (see below). The Jungle by Upton Sinclair contains a section in which the main character, Jurgis Rudkus, abandons his family in Chicago and becomes a hobo for a while. Knights of the Road, by Roger A. Bruns, 1980. ISBN 978-0-416-00721-3. Lonesome Road, by Thomas Minehan, 1941. One More Train to Ride: The Underground World of Modern American Hobos by Clifford Williams. Laugh-Out-Loud Cats, webcomic by Adam Koford, featuring two anthropomorphic cats as hobos. 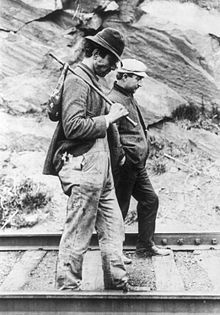 Many cartoons depict hobos as main or secondary characters, hobo related activities such as traveling by train, with a bindle, or in company of hobos. For example, 8 Ball Bunny (1950) with Bugs Bunny, Merrie Melodies Hobo Gadget Band (1939), Mouse Wreckers (1948) and MGM's Henpecked Hoboes (1948). The Avenger and master archer in Marvel Comics, Hawkeye, is aware of, and can read Hobo Code in Matt Fraction and David Aja's 2012 run on the character. USA Comics #2 (1941) introduced Vagabond, a police officer named Pat Murphy who created an alter ego, Chauncey Throttlebottom III, a well spoken hobo, to fight crime. USA Comics #5 (1941) had a character, Butch Brogan, alias Fighting Hobo, that helps save a kidnapped puppy in "The Dog-Nappers." The TaleSpin comic The Long Flight Home reveals Kit Cloudkicker was once a hobo prior to working for Don Karnage. Hobo (1992), a documentary by John T. Davis, following the life of a hobo on his travels through the United States. American Experience, "Riding the Rails" (1999), a PBS documentary by Lexy Lovell and Michael Uys, narrated by Richard Thomas, detailing the hobos of the Great Depression, with interviews of those who rode the rails during those years. The American Hobo (2003), a documentary narrated by Ernest Borgnine featuring interviews with Merle Haggard and James Michener. The Human Experience, (2008), a documentary by Charles Kinnane. The first experience follows Jeffrey and his brother Clifford to the streets of New York City where the boys live with the homeless for a week in one of the coldest winters on record. The boys look for hope and camaraderie among their homeless companions, learning how to survive on the streets. 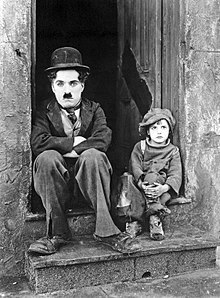 Red Skelton's "Freddy the Freeloader"
The Kid (1921), directed by Charlie Chaplin. The Circus (1928), directed by Charlie Chaplin. City Lights (1931), directed by Charlie Chaplin. Number Seventeen (1932), directed by Alfred Hitchcock. Wild Boys of the Road (1933), directed by William A. Wellman. City Limits (1934), directed by William Nigh. Modern Times (1936), directed by Charlie Chaplin. Father Steps Out (1941), directed by Jean Yarbrough. Sullivan's Travels (1941), directed by Preston Sturges. Jack London (1943), biopic directed by Alfred Santell. It Happened on Fifth Avenue (1947), directed by Roy Del Ruth. Emperor of the North Pole aka Emperor of the North (1973), directed by Robert Aldrich. Loosely based on Jack London's The Road. Hard Times aka The Streetfighter (1975), directed by Walter Hill (his directorial debut), and starring Charles Bronson (as a hobo turned street fighter) and James Coburn (as a gambler who becomes his manager). The Billion Dollar Hobo (1977), starring Tim Conway and Will Geer. Vagabond (1985) (French title: Sans Toit Ni Loi), directed by Agnès Varda, tells the story of a traveling woman's untimely death through flashbacks and interviews with the people who met her. The Journey of Natty Gann (1985), starring Meredith Salenger as a young girl riding the rails to find her father. Ironweed (1987), directed by Héctor Babenco and based on the Pulitzer Prize-winning novel by William Kennedy, who also wrote the screenplay. Stars Jack Nicholson and Meryl Streep, with Carroll Baker, Michael O'Keefe, Diane Venora, Fred Gwynne, Nathan Lane, and Tom Waits in supporting roles. Life Stinks (1991), directed by and starring Mel Brooks. Tokyo Godfathers (2003), an anime directed by Satoshi Kon. Into the Wild (2007), directed by Sean Penn, based on Jon Krakauer's non-fiction book about Christopher McCandless. Resurrecting the Champ (2007), starring Samuel L. Jackson and Josh Hartnett, directed by Rod Lurie. Kit Kittredge: An American Girl (2008), starring Abigail Breslin, Chris O'Donnell, Julia Ormond and Max Thieriot. Directed by Patricia Rozema. Hobo with a Shotgun (2011), an exploitation film directed by Jason Eisener and written by John Davies, starring Rutger Hauer as a vigilante hobo. The Muppets (2011), the film features a character named Hobo Joe (played by Zach Galifianakis) and some Whatnot hobos. They later appeared in the sequel Muppets Most Wanted (2014). Man of Steel (2013) depicts Clark Kent living as a homeless itinerant worker before ultimately taking the mantle of Superman and finding work as a reporter at the Daily Planet. Musicians known for hobo songs include: Baby Gramps, Railroad Earth, Ramblin' Jack Elliott, Utah Phillips, Jimmie Rodgers, Seasick Steve, and Boxcar Willie. "Big Rock Candy Mountain" by Harry McClintock, recorded by various artists including Burl Ives, Tom Waits, Lisa Loeb, Baby Gramps, The Restarts and Harry Dean Stanton. "Here Comes Your Man" by the Pixies is about hobos travelling on trains in California and dying because of earthquakes. "Orange Claw Hammer" by Captain Beefheart which contains the lyric: "I'm on the bum where the hobos run, the air breaks with filthy chatter." "Jesus' Blood Never Failed Me Yet" a recording of a hobo singing on a London street, by composer Gavin Bryars. "Ramblin' Man" by Hank Williams Sr.
King of the Hobos (2014), a one-man musical that premiered at Emerging Artists Theatre in New York City, is centered around the death of James Eads How, known during his lifetime as the "Millionaire Hobo". In The Simpsons (The Old Man and the Key) , Grampa explains hobo symbols to Bart. In other episode, the Simpsons meet a hobo who tells them American folktales in exchange for a spongebath. Shameless (Season 9), Episode 10 and 11. Frank Gallagher becomes part of a Hobo competition, a competition looking for the best Hobo in Chicago. Look up hobo in Wiktionary, the free dictionary. Wikimedia Commons has media related to Hobos. Kirby, Texas, the "hobo capital of Texas"
^ a b c "On Hobos, Hautboys, and Other Beaus". OUPblog. Oxford University Press. November 12, 2008. Retrieved 2009-08-05. ^ Bryson, Bill (1998). Made in America. Transworld Publishers Limited. 161. ISBN 978-0-380-71381-3. ^ Mencken, H.L. (1937). "On the road again". The American Language (4th ed.). grammarphobia.com (July 25, 2009). Archived from the original on 2012-05-05. Retrieved 2013-05-06. ^ Mencken, Henry Louis (25 August 2017). "The American Language: An Inquiry Into the Development of English in the United States". Knopf – via Google Books. ^ "Virginia.edu" (PDF). Archived from the original (PDF) on October 17, 2012. Retrieved 2013-05-07. ^ "Life and Times of an American Hobo". Allvoices. 2010-09-21. Archived from the original on 2012-10-13. Retrieved 2015-11-01. ^ Conover, Ted (1984). Rolling Nowhere. New York: Viking. p. needed. ISBN 978-0-670-60319-0. ^ Bruns, Roger (1980). Knights of the Road: A Hobo History. New York: Methuen Inc. p. 201. ISBN 0-416-00721-X. ^ Moon, Gypsy: "Done and Been", page 198. Indiana University Press, 1996. ^ a b c Moon, Gypsy: "Done and Been", page 24. Indiana University Press, 1996. ^ Rothstein, Edward (August 1, 2014). "Security Secrets, Dated but Real". New York Times. Retrieved 2014-08-02. ^ "National Cryptological Museum—Virtual Tour". Retrieved 2010-10-05. ^ "QR Code Stencil Generator and QR Hobo Codes". F.A.T., Free Art and Technology Lab. 2011-07-19. Retrieved 2012-07-18. ^ "Hobo Code". National Hobo Museum. Archived from the original on July 24, 2011. ^ Lammle, Rob. "Strange States: Iowa's Hobo Convention". Mental Floss. Retrieved 2015-11-01. ^ "Monte Holm Dead at 89". Original Nickel Hobo Society. Retrieved 2010-02-06. ^ "Tucson Citizen Morgue". Tucsoncitizen.com. 2009-04-06. Retrieved 2013-05-07. ^ "Louis L'amour: A brief biography". louislamour.com. Retrieved 2008-12-07. ^ "Down and Out in Paris and London". Archived from the original on October 10, 2012. Retrieved 2012-12-07. ^ Van Ronk, Dave. The Mayor of MacDougal Street. 2005. ^ "Dale Wasserman, 94; Playwright Created 'Man of La Mancha'" obituary by Dennis McLellan of the Los Angeles Times, printed in The Washington Post December 29, 2008. ^ "American Travels of a Dutch Hobo, 1923–1926: Gerard Leeflang: 9780813808888: Amazon.com: Books". Amazon.com. Retrieved 2013-05-07. ^ "The Great Depression - The Story of 250,000 Teenagers Who Left Home and Ride the Rails". Erroluys.com. 1933-04-17. Archived from the original on 2013-05-05. Retrieved 2013-05-07. ^ "Here Comes Your Man". Frankblack.net. Retrieved 2013-05-07. Brady, Jonann (2005). "Hobos Elect New King and Queen". ABC Good Morning America, includes Todd "Ad Man" Waters' last ride as reigning Hobo King plus hobo slide show with Adman’s photo’s taken on the road. Bannister, Matthew (2006). "Maurice W Graham 'Steam Train', Grand Patriarch of America's Hobos who has died aged 89". Last Word. BBC Radio. Matthew Bannister talks to fellow King of the Hobos "Ad Man" Waters and to obituary editor of The New York Times, Bill McDonald. Davis, Jason (2007). "The Hobo", On The Road 30 minute special. KSTP television. Covers "Ad Man" Waters taking his daughter out on her first freight ride. Johnson, L. Anderson. "Riding the Rails for the Homeless." "The New York Times." July 12, 1983, sec B page 3, col 3. Story on "Ad Man" Waters The Penny Route. Oats. "Around the Jungle Fire I, II & III." 1994, 1997, 2000. Interviews with several hobos: How they got their start, and travels and travails.